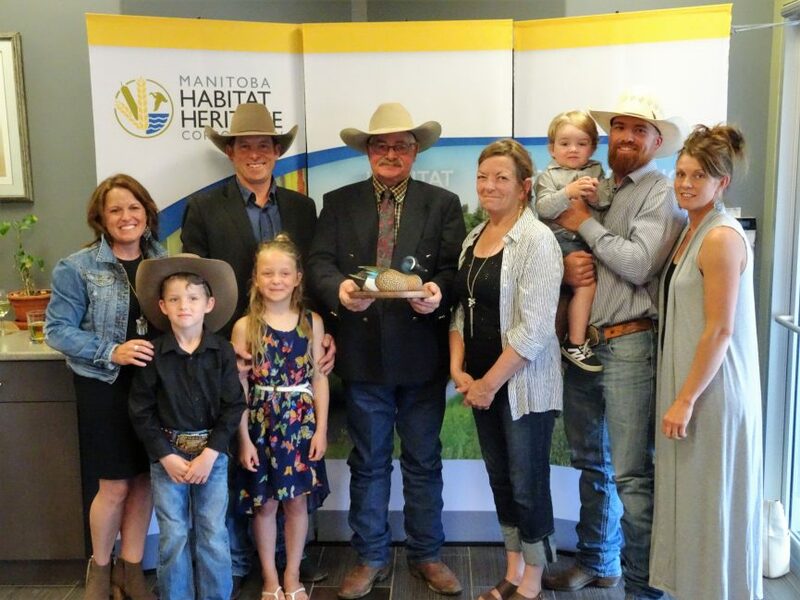 The Manitoba Habitat Heritage Corporation is pleased to recognized a long supporting family Virden, MB for their ongoing contribution to wildlife and habitat conservation! In recognition of their efforts, MHHC presented the Hagan family with the National Blue-winged Teal Award, presented on an annual basis by the North American Waterfowl Management Plan through, Environment and Climate Change Canada and the U.S. Fish and Wildlife Service. MHHC is delighted that this three-generation family was chosen as the recipient for this year’s award. “The Hagan family has been working with us since 2003 and in total they have almost 4900 acres of natural land that is permanently protected. This is by far the largest number of easements within a single farm operation that has been achieved in Manitoba,” said Tim Sopuck, MHHC Chief Executive Officer. The National Blue-winged Teal Award is presented to individuals, partnerships or programs whose activities result in substantial benefits to waterfowl, other wetland associated migratory bird populations or wetlands habitats as a onetime, periodic or ongoing effort. Shawne and Jocelyn Hagan initiated the first agreement with MHHC fourteen years ago and as their sons, Alistair and Thomas, joined the family farm they continued to partner with MHHC. In total, the families have 15 conservation easements. Their farming operation focuses on cattle production and horse breeding. As the Hagans are part of the regenerative agricultural movement, they found that programs through MHHC match well with what they are trying to accomplish on the land. “With regenerative ag, the whole point is looking at the ecosystem as a whole. If you’re benefiting your cows, you are also benefiting the bird population, the bug population and the pollinators. There’s a paradigm shift that turns you from kind of being a commodity farmer to looking at things as a whole. When you do that, you realize that you have to take care of everybody living on your land for you to be profitable and as a result you have to start building a beneficial environment for all of them,” said Thomas Hagan, Oak Lake Cattle Producer.